DHAHRAN, SAUDI ARABIA (April 14, 2005) - Saudi Aramco said "thank you" to more than 50 expatriate employees who are retiring this year for their many years of contributing to the success of the company and the Kingdom. 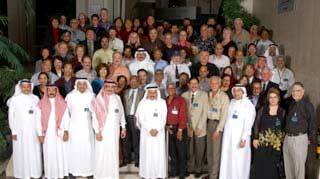 At the 2005 Retiree Dinner, held April 11 at the Saudi Aramco Exhibit here, executives wished a fond farewell to retiring expatriate employees from across the company and from several different countries. Yusof Rafie, senior vice president of Industrial Relations and the evening's host, said each of them had been an important part of the company's success. He said management was aware that their contributions represented a tremendous sacrifice, and he thanked the retirees for that sacrifice and their contributions. He also thanked the spouses, many of whom attended the dinner, for their contributions to the quality of life in Saudi Aramco communities. "It is your selfless commitment that has made our communities rich, diverse, abuzz with activity, and a place we're proud to call home," he said. Rafie also remembered the spouses who could not be there. "They lived apart from their spouses and dedicated themselves to the well-being of their families and local communities," he said. "They too are part of the larger Saudi Aramco community." He said their contributions would long be remembered. "You have been our colleagues, our neighbors and our friends, and you will be greatly missed." During dinner, the retirees enjoyed a concert of traditional Arab music performed by Saudi Aramco employees. Rafie emphasized that the retirees' work helped make Saudi Aramco an industry leader and an enterprise known throughout the world as a dependable supplier of energy. Moreover, he said, the employees helped make Saudi Aramco a socially responsible company that involves itself with local communities and cares for the natural environment. He wished each continued success and happiness. Mustafa A. Jalali, vice president of Saudi Aramco Affairs, said the retiring employees will always be a part of the Saudi Aramco family. "We want to demonstrate that we care and want to stay connected. We also want to show our gratitude for your years of service." Abdulaziz F. Al-Khayyal, senior vice president of Refining, Marketing and International, said that when the retirees were first hired, their orientation program let each person know the company was glad they were coming to work for Saudi Aramco. "Why shouldn't we take care of our employees just as thoroughly when they retire?" he asked. "A good company values its employees on both the front and back end. It's not the end of the relationship." 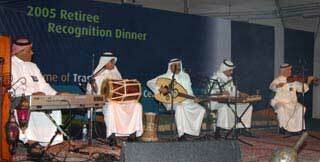 During dinner, the retirees enjoyed a concert of Arab music performed by Saudi Aramco employees. The retirees also expressed their appreciation. Fred Kleve, a 25-year employee, and his wife, Julia, will retire to New Zealand in October. He said his career here had been "wonderful" and thought it "fantastic that the company was saying 'thank-you' to us as well as giving us the tools to serve in an ambassadorship capacity." Mario Salazar and his wife, Yolanda, will retire to Texas in July after 24 years with the company. He said he was grateful for the company's gesture in saying, "Thank you for your efforts. Let's stay in touch."